Exclusive photo tour to Cuba. 17 of August. August is one of the hottest months in Cuba, but it's a great month to take photos as everyone is on vacation and parks, streets, beaches, etc. are full of life that we can capture with our cameras, it’s certainly the best month to practice street photography and get great portraits on the streets, mainly in the Havana. In addition, there are the carnivals in Havana and as photographers we cannot miss this multicolored party full of music with great photographic opportunities. 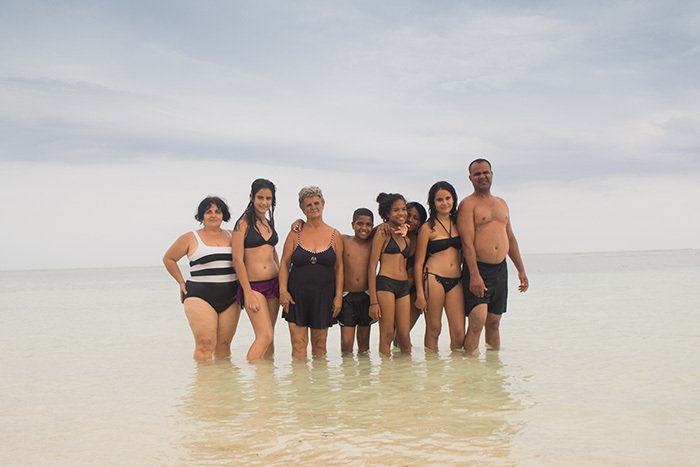 A photo session on Cuban beaches is another activity we do in the month of August as many Cubans are enjoying their vacations and it’s a great opportunity to make fun family photos, and document the real life on the island during August. It’s not easy to find other photography travels to Cuba, the reason is simple, American photographers who work occasionally in Cuba usually offer their photo tours from October to April. My case is different, I have lived in Cuba for 20 years and I offer my photo tours almost every month of the year, I designed my photo workshops so we’re able to enjoy summer months too. In July and August, we make a 2-hour stop to rest at noon thus, avoiding the hottest hours, dividing the day into two photo sessions, one in the morning and one in the evening. An exclusive photo tour to Cuba, visiting Havana and Viñales, the two places that best summarize the character of the Cuban people, the big city and the countryside where the last tobacco leaves are still being collected in March. We will not only learn photography from Louis Alarcon, but will also deeply know Cuba, mainly its human part. Louis arrived in Cuba in 1998 and developed his project “Photographing Cuba” exclusively on the island, undoubtedly the number one specialist in photo workshops in Cuba. This exclusive workshop is designed for small groups of between 2 and 7 people, not so many people can visit places and move much better than a larger group, also analyze the photos of each traveler is almost impossible when the group exceeds 7 people. After more than 20 years in Cuba Louis has designed this photo workshop for travelers of any nationality who are passionate about travel, people and photography, a photo tour away from the most touristic areas, with accommodation in official Cuban rental houses where the touch with the Cuban people is narrower. 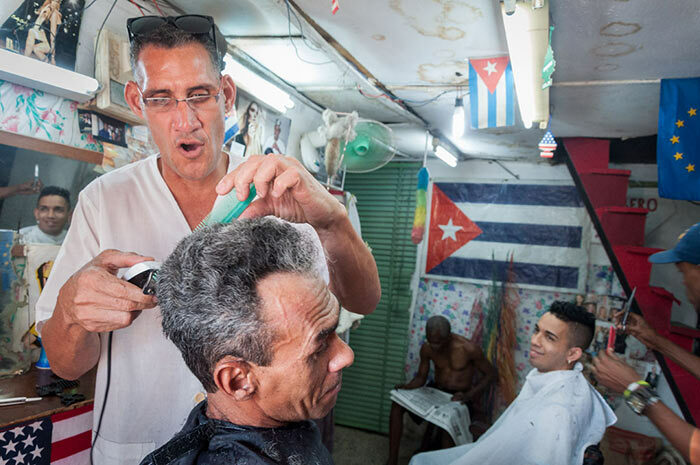 In Havana, you will experience and photograph daily Cuban life, markets, portraits, etc. mixing and mingling with the locals at unique locations such as boxing gyms, colorful Afro-Cuban dancers. Outside of Havana you will witness first-hand the beautiful countryside and a rural Cuba not seen in the guidebooks: interior of Cuban farmer houses, tobacco houses, etc. Because we run our photography tours privately in small groups (no more than 7 people per tour), we can be 100% flexible with the itinerary, taking advantage of any unforeseen events or developments that help provide the perfect backdrop for photographic opportunities. We think this flexibility adds to the adventure and the intrigue. Our Photography tours are designed to take you to the most photogenic locations to shoot in the best light. They are also designed to help you visualize a scene before capturing that magical moment. We aim to enhance your creativity and raise your awareness, so you can leave Cuba with images that you will be very proud of for years to come. Furthermore, you will learn how to study a landscape and approach your environment, the cultural considerations of photographing people that are indigenous to the region and the challenges of photographing in a country that is foreign to you. This photo tour to Cuba, is 100% focused on photography, people and culture. - Take outstanding photos of Cuban people and activities away from the tourist scene. - Learn about the forbidden pictures. - Capture the interior of Cuban houses. - Get expert tuition on a camera´s configuration, proper lense use, etc. - Enjoy and work like a professional who knows how to choose the best pictures. - Tell stories with your series of photographs. - Visit an Afro-Cuban priest and photograph Afro-Cuban dancers. - Discover a boxing gym of a former Olympic Champion. - Find the Che Guevara Graffiti route in Havana. - Take portraits of farmers, photos of landscape in Vinales village, visit to their special farms and "tobacco houses". - Experience the Havana´s life and Malecon scenes, including sunset in the right place at the right time. - Rest in official Cuban houses. This trip may be an advanced photography workshop or a relaxed photo tour, depending on the desire of each of the travellers. I offer you a wide range of possibilities and great flexibility in order to enjoy a custom-tailored trip. This exclusive trip is organized and sold by Locally Sourced Cuba Travel Agency ; here you can find all the details for booking your spot. Locally Sourced Cuba Tours also offers affordable licensed people-to-people Private Cuba Tours, through our partnership with the US-based Educational Adventures Company. This is a fantastic way to experience our authentic, local and personal tours, legally and hassle-free. In order to clearly understand these photographic journeys and my style, you may see the videos recorded during my guided tours around Cuba. Photographing Cuba by Luis Alarcón. Workshops and photo tours in cuba from Louis Alarcon on Vimeo. Today is the photo tour arrival day and we will organise an airport transfer to your accommodation in Havana. This will be your first opportunity to meet with Louis and your guide to discuss the itinerary. This evening will also present the perfect opportunity to take a walk along the Malecon with your hosts, feeling the sea breeze and seeing all that the city has to offer. B,L,D – denotes Breakfast, Lunch and Dinner. Today you will have your first opportunity to capture the lively street theatre of Havana Vieja. Louis and your guide will take you to streets not often frequented by tourists as well as the main squares and points of interest. Today Louis will also share with you tips about taking photos in Cuba, including the Cuban personality with photographers and the people and places you shouldn’t photograph. The focus today is on Cuban culture and Cuban people. You will also have the opportunity to photograph colourful markets, courtyards and terraces as well as a vintage gym which provides a very unique atmosphere. During the day Louis will ask you to share with him you photos, so you can discuss and analyse, as you can see in this link with photos of our previous travelers. Today the focus is on Afro-Cuban roots and Afro-Cuban religion. In the evening during sunset, we will visit the Malecon and the Prado intersection. Making sure we are in the right place at the right moment, in the right light! This morning we will be up early and on our way to the rural township of Vinales. We will have lunch at the Los Jazmines look-out point and you will be blown away by the natural beauty of this area. Today you will have the opportunity to photograph the Vinales valley, prehistoric mural and the Palenque de los Cimarrones. Accompanied by Louis and you local guide, you will learn all about the special lifestyle in this area. The evening provides a fantastic opportunity to enjoy local music amongst the warm and friendly locals. This morning we will be up early again to journey into the heart of the valley. Hear we will meet farmers who are preparing their morning coffee and meet the local wildlife amongst a sea of green back-drops. You will have the opportunity to go inside the houses of the locals, getting to know the families as you share a local “criollo coffee”. Be ready to capture memorable portraits and daily scenes of this special part of Cuba. Take photos of the beautiful Vinales valley until your heart is content and visit a Tobacco farm to see a cigar rolling demonstration and learn more about the local industry. In the afternoon you will travel back to Havana with Louis and your guide. Today we continue to focus on street photography, exploring new areas of the city. We will focus on the Classic American cars that cruise the streets as well as external colonial facades and families on balconies. We will visit a Cuban family in Havana to learn more about daily life and meet a former Olympic Boxing champion at his own Gym. You will also visit the San Jose Market meeting well known painters, sculptors and artisans. This is a great opportunity to view and buy cuban art, finding many photographic opportunities that mix paintings with people. Louis will always be there to review your work, offering advice and assistance to help you improve as a photographer. Today we will follow the Che Guevara route in Havana. There are many graffiti works of Che Guevara in Havana of which some are hidden and others are not. While strolling the Che Guevara Route you will visit other points of interest and visit a popular Cuban photographer to learn more about their work and photography in Cuba. We will end the day with a special farewell dinner. Touristic video documentary on Cuba.